Similar to Friedberg 64 (W-650). 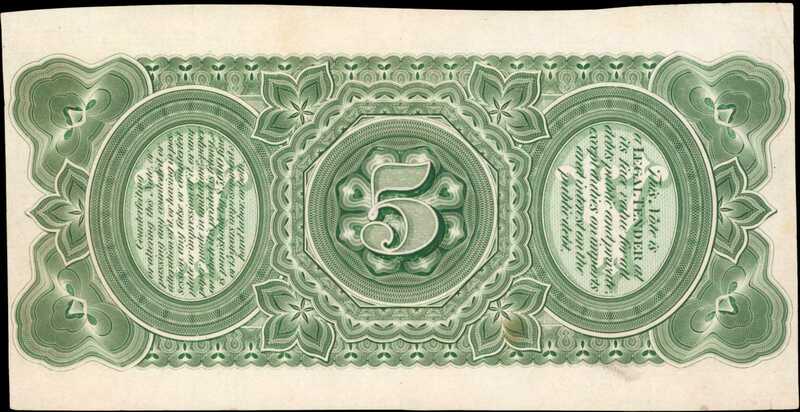 1869 $5 Legal Tender Note. PCGS Currency Very Fine 35. Essay Back Proof.Hessler-Unlisted. India paper only. American Bank Note Company. Central outlined 5 counter with flanking counterfeit clause and obligation. An important proof that shows an earlier stage of production for this very popular 1869 $5 Legal Tender type. Differs from the final design as it is lacking numeral Vs in the corners and is also without UNITED STATES, OF AMERICA wrapped around the central counter. It also lacks the imprints found at the top and bottom of the issued styling. Just lightly folded from improper storage but otherwise completely bright and attractive. Unique in our opinion as this impression is the only one for which we could find a record. The design is unbelievably ornate and intricate. As it differs slightly from the adopted design it combines historical significance with great rarity.From Harry E. Jones via private pruchase; Nascas (a division of R.M. Smythe) sale of June 20-21, 1986, lot 1412.